Did James Bama paint the cover art for the 1965 Bantam KING KONG Paperback? It's been a very long time since I've posted here. Hope all is well with everyone. I'm currently working on a project, and I am hoping that someone who is knowledgeable about artist James Bama will be able to please tell me whether he had painted the cover for the King Kong paperback novel that was published in 1965 by Bantam Books. 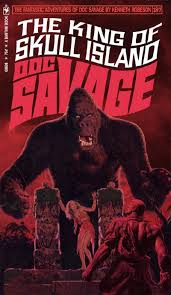 The cover is predominantly brown, with an illustration of Kong and Fay Wray and the title in yellow-orange coloured words, and the blurb "Never before in paperback! The all-time king of the monsters" appearing at the top of the cover. If anyone can please confirm that he did the artwork and could let me know, I would be most grateful. Additionally, I am also trying to locate the names of other artists who painted or designed covers for other (preferably vintage) paperback horror film and TV-show novelizations. If anyone knows of any, and could please let me know, that would be fantastic, and very much appreciated. PMs are also welcome, if you'd rather not post publicly. 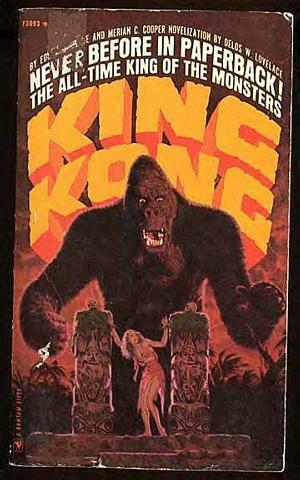 Re: Did James Bama paint the cover art for the 1965 Bantam KING KONG Paperback? Hello, James! Welcome back to the UMA. This is a great forum. I am sure someone will provide an answer. James Bama is such a fantastic artist. Swiped for a Doc Savage cover, with Doc added. PMs are also welcome, if you'd rather not post publicly. Huh?! I absolutely wouldn't be able to understand the thinking of any member who would be reluctant to share info with his fellow posters. Thank you so much for confirming this, I really appreciate it! And thank you for attaching the photos. It's beautiful artwork, and very fitting that James Bama painted this! I've actually had a handful of instances where contributors wished to communicate through PM, and not on the boards. It was a while back and I can't recall if it was here at UMA or somewhere else. Perhaps they were shy and wanted to stay out of the limelight! Take care, have a great night! Thanks so much for the link, Hepcat! I really appreciate it.